Ahhh...fall. The kids are back in school, the temperatures are cooling a bit, and a quilter's thoughts are turning to starting a new quilt or, dare we say it, finishing one of their many UFOs. With over 120 UFOs of my own at last count, I think I have won that contest. It's a dubious honor! 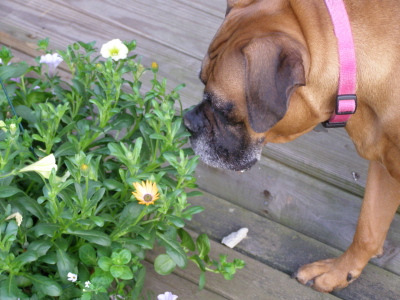 And taking time to smell the flowers. 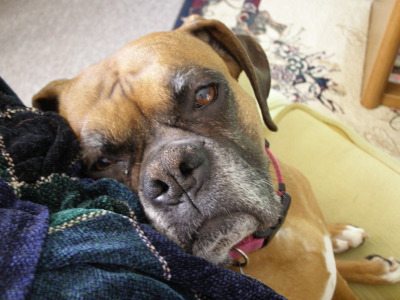 If you are interested in adopting a boxer or learning more about how you can help in the rescue effort, please go to www.adoptaboxerrescue.com; the faces of these dogs and their stories will inspire you. 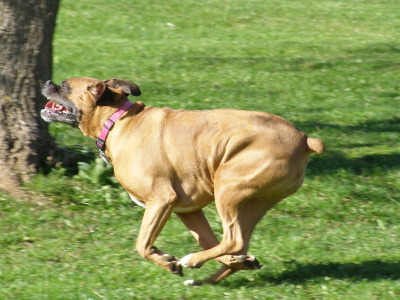 Lynnie is the second boxer I have adopted through AABR; it's all volunteers and they do a terrific job of rescuing these dogs and of finding them safe and loving homes. The flowers have been exceptional this year. Here are a few pictures for you to enjoy. And here I am...in my sunflower tiara at our retreat. Silly...yes; funny...yes; absolutely outrageous...YES! I don't have the picture yet, but at one time I was wearing both my sunflower tiara AND my silver bejeweled tiara at the same time. It will probably surprise you to know that I also have a magic wand. I'll share the pics when I get them. In one of the newsletters that was lost in the host meltdown last year was my "Food for Thought" article. I am including it again here. Enjoy! Too often we put aside what our hearts yearn for because we feel we must achieve what others expect of us first. But do they really expect it--or are we putting that pressure on ourselves. Does anyone really notice the clean house? Laundry, maybe--but mostly when there is nothing clean to wear! By giving yourself permission to do something for yourself, you are actually renewing your energy and mental health. Can't make that time commitment at your house? How about the buddy system--quilting together is good for everyone involved. Or how about treating yourself to a class? That is truly dedicated time for quilting and you will leave feeling refreshed and having learned a new skill. Even if you are an experienced quilter, you can always learn something if you keep an open mind. The interaction with others is stimulating--people choose colors differently, or may have another way of doing something you've been struggling with. Don't get to the end of your life and say "I wish I had…." Start now to find a way to integrate what you want to do with what you must do. Surprisingly, it does all fit. At first you may think you are being selfish--don't give in to that feeling--remember what they say on the airplanes: "Put your oxygen mask on first--then help those around you." Consider quilting your oxygen mask--put it on!